A weak dollar may be beneficial to the US in the short term, but it is undermining the dollar’s long-term status as the de facto global currency. One of the rocks on which the global economy has been founded since World War II is a strong US dollar. As a projection of the United States’ political, military and financial might, it has been all-powerful for more than half a century. As a means of exchange for goods and services the world over, including all commodities and much international trade, it has seemed unassailable. Now, that dominance is coming to an end for financial, economic and political reasons. 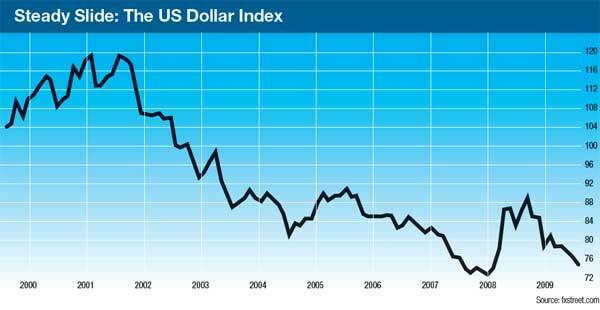 Over the past year, the US dollar/euro exchange rate has declined from $1.25 to $1.50. BNP Paribas economists expect that by spring or early summer 2010 the dollar/ euro rate could touch $1.55—a fall of more than 3% in little more than six months. To be sure, part of the reason for the current weakness of the dollar—and its negative outlook over the next two years—is a normal cyclical phenomenon regarding rate expectations. Australia and Norway have already begun tightening policy, and market participants are looking for the next major-economy central bank to make a move. “Other [central banks] are set to follow early this year,” says Adam Cole, global head of FX strategy at RBC Capital Markets in London. The widespread assumption is that the US Federal Reserve will be among the last central banks to follow suit and raise rates because its economy, along with that of the United Kingdom, is the most structurally challenged and therefore needs as much monetary largesse as possible. “Moreover, along with the UK, the US will have to reverse its quantitative easing policy before it embarks on rates rises, which are therefore some way off,” says Cole. The expected disparity in rate movements around the world means that the dollar is going to be unattractive on a yield basis and helps to explain some of its weakness. However, there are a number of other longer-term phenomena that explain why the dollar can be expected to remain weak. 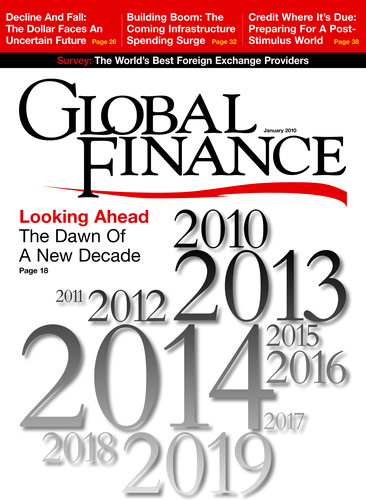 While the financial and economic crisis has exacerbated and highlighted a number of these trends, many have been evident for years. One of the main ingredients among the cocktail of negative influences on the value of the dollar is the perceived creditworthiness—or lack of it—of the US government, which is currently running a deficit of $12 trillion. The markets are prepared to cut the US a lot of slack because it is the world’s largest economy and remains the issuer of the world’s reserve currency. That makes it easier for the government to sell bonds and support itself in the short term. 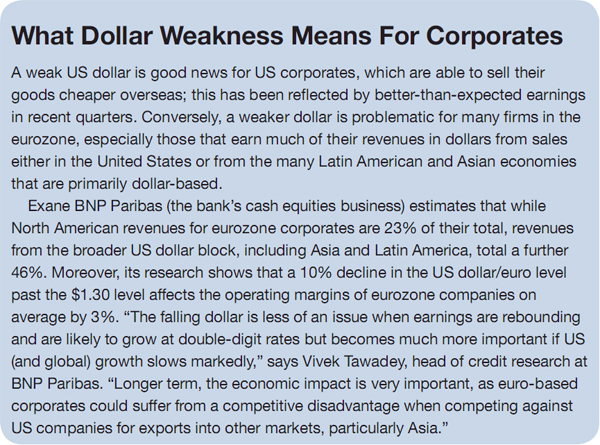 “Nevertheless, the current situation does raise concerns, and that is reflected in the dollar’s value,” says RBC’s Cole. Cole agrees that the renminbi will eventually become a reserve currency but says that 10 years is too short a time horizon. “It would need to become convertible first and then become widely accepted globally before becoming a reserve currency, and that’s more likely to take 20 or 30 years,” he says. Moreover, deep and liquid financial markets are needed to support a currency if it is to be a reserve currency; currently only the euro comes close to the dollar in that respect. While the dollar might be becoming less important as a reserve currency, the actions of central banks are insignificant compared to global trade volumes— much of which is conducted in the US currency. The convention of using the dollar to price trade and commodities is a reflection of the US economy’s dominant position following World War II— just as sterling played a similar role in the late 19th and early 20th centuries. “As the US role dwindles, the dollar’s importance will be pared back,” says Minikin at Standard Chartered.